Everybody loves a bargain and naturally, every parent’s definition of a budget-friendly family resort or hotel is going to differ. However, many of us can agree that when you’re planning a trip with children, certain amenities cannot be sacrificed, no matter how enticing the rate. When it comes to bang for your buck, these properties deliver. They offer great values when compared to others in their destinations, as well as rates and amenities for both children and adults that are comparable or superior to nearby competitors. Check out our list of the best budget-friendly family resorts. For starters, Dunes Village Resort is located right on the beach in Myrtle Beach, South Carolina, and is a 10-minute drive from the Myrtle Beach Boardwalk and Promenade. Add to that an indoor water park, playground, arts and crafts, magic shows and rooms for every size family -- the largest one can sleep 16 -- and it's a value-packed resort vacation. What Makes It a Family Vacation on a Budget? Dunes Village Resort is constantly offering packages and other pricing incentives, with rates often listed for $100 or less per night. With a prime location on the shores of Maui's famous Ka'anapali Beach, families may think the Ka'anapali Beach Hotel charges prices comparable to other large resorts in the area. But that isn't the case. This budget-friendly family resort features lots of genuine Hawaiian touches, personalized service, a neat whale-shaped pool and beautiful landscaping along 11 acres of soft sand. Families can book budget-friendly rooms that connect to other accommodations for more space. Plus, the hotel allows children 17 and under to stay free in the same room as parents. The hotel hosts a free children's program for kids ages 12 and under, and the Aloha Passport for Kids program offers property tours and activities like hula lessons and lei making. Make sure the kids don't forget to grab their free Hawaiian souvenir! Looking for the best way to experience the Bahamas on a budget? The Comfort Suites Paradise Island offers beautiful views of the island, as well as neighboring Atlantis Resort. Additionally, the hotel has guestrooms with mini-fridges and free Wi-Fi, a complimentary continental breakfast daily, and a pool with a swim-up bar. The major draw is that guests receive full access to the facilities at Atlantis Resort, including Aquaventure water park, the spa, kids' clubs, casino, and Dolphin Cay. Yes, seriously! You can also ask for signing privileges at the various Atlantis restaurants. Basically, you can spend the entire day at the resort, only to return to the Comfort Suites for a restful night's sleep (for less). The first value-category hotel to open at Universal Orlando Resort, Universal's Cabana Bay Beach Resort is a budget-friendly family hotel with the perks of a luxury resort. Families enjoy lazy rivers, pools and even man-made beaches (bring your own inner tubes); dive-in movies; outdoor games; an arcade; bowling alley; and onsite dining. Just don't forget to leave the resort and explore the theme parks -- they're accessible via a complimentary shuttle. The resort's rooms sleep up to six guests, and offer spacious bathrooms with dual sinks and kitchenettes for storing drinks and snacks to cut down on costs. IBEROSTAR Paraiso Beach offers affordable, all-inclusive rates that cover all meals, pools (one of which has a kids' playground), organized activities, a kids' club, live entertainment, and access to a gorgeous beach in Riviera Maya. Rooms have balconies and free Wi-Fi, and trust us -- you'll absolutely need the internet to share these views on Instagram! The resort (and many properties by IBEROSTAR) regularly offers discounted rates, oftentimes featuring rates around $100 per person, per night. The Holiday Inn & Suites Virginia Beach - North Beach isn't your average Holiday Inn. The property has three pools -- two outdoors and one inside, each with special features. There's also a movie theater and seasonal kids' programming. When it's time to eat, you don't even need to leave the hotel, as it offers three onsite restaurants -- including Isle of Capri, with floor-to-ceiling views of the ocean. The hotel is situated on the beach at a quiet end of Atlantic Avenue (the main strip), providing families with easy access to the sand and surf. 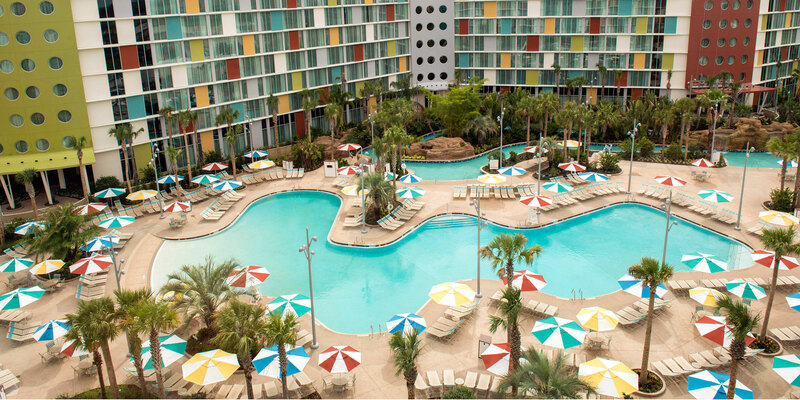 One of Disney World's best-loved budget family resorts, Disney's Pop Century Resort offers families a great value on accommodations. The largest of the five Disney Value Resorts, Pop Century is closest to Epcot and has three pools, a playground and a large food court. Purchase a souvenir mug and enjoy free refills on all hot and cold drinks at the food court for even more savings. Rates are extremely reasonable for a Disney property and guests staying at the Pop Century Resort get perks like Extra Magic Hours, which allow you to arrive early and late to the parks on certain days, and free bus transportation to all Disney World parks. You'll also have the ability to make FASTPASS+ reservations up to 60 days in advance. With locations across the U.S., plus one property in Niagara Falls, Canada, Great Wolf Lodge is very accessible for families. These indoor water park resorts offer waterslides, lazy rivers, wave pools, and more for kids, with arcades, mini-golf, onsite dining, and more for teens and adults. Great Wolf Lodge hotels have family suites that can sleep large groups or families, with bunk beds, separate bedrooms and kitchenettes. Plus, all per-night room rates include admission to the onsite water parks for each guest, from the minute you arrive -- even before check-in -- to after you've moved the bags to the car after check-out! Additionally, year-round deals and packages allow families to save even more. Sprawled across 165 acres in northern Vermont, on the shores of Lake Champlain, the all-inclusive Tyler Place Family Resort is intimate, yet full of fun for all ages. The resort is open seasonally, May through September, and makes for a great outdoor escape for the family without sacrificing amenities and luxuries. The all-inclusive prices are per person and include private accommodations in cottages, studios or family suites; all meals, including picnic baskets or candlelight dinners for parents; infant, toddler, children and teen programs; tennis, sailing, swimming, biking, volleyball, and other activities; and evening entertainment, from dance parties and game nights, to bonfires and ice cream socials. Located on Lake Superior in Lutsen, Minnesota, the Lutsen Resort features cabins, villas, condos and townhomes, all with budget-friendly rates. The budget-friendly family resort is open year-round with activities fit for all seasons, from kayaking, biking and hiking in the spring, summer and fall, to snowshoeing and skiing in the winter. During the summer, the resort opens its kids' camp for children ages 4 to 12, which allows parents time for a massage at the onsite spa or a round of golf on the nine-hole course (no tee times or fees). Lutsen Resort offers killer rates year-round, often around $100 per night, plus great packages that often include free nights and meals. Plus, a majority of the onsite activities are free to guests. 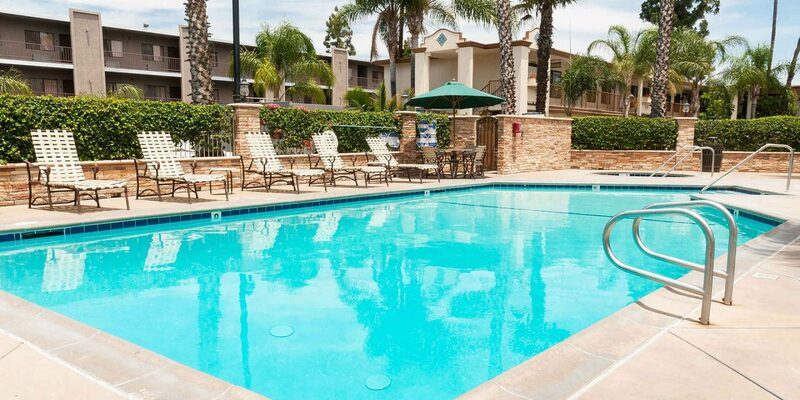 For the biggest bang for your buck right outside Disneyland Resort, book a stay at the Park Vue Inn. This boutique hotel in Anaheim is a short walk from the entrance to Disneyland and Disney's California Adventure, and it offers a plethora of complimentary amenities. It's no wonder this property is labeled a Disney Good Neighbor Hotel! Enjoy guestrooms with bunk beds for the kids, free Wi-Fi, mini-fridges and microwaves, as well as an onsite heated pool and a patio area that's great for viewing the Disney fireworks at night. Besides its location, the Park Vue Inn has free parking, complimentary Wi-Fi and a free hot breakfast daily. Plus, guests can buy discounted theme park tickets at the hotel.